ppOpen-HPC and pK-Open-HPC are open source infrastructures for development and execution of large-scale scientific applications on post-petascale (pp) supercomputers with automatic tuning (AT). Both of ppOpen-HPC and pK-Open-HPC focus on parallel computers based on many-core architectures and consist of various types of libraries covering general procedures for scientific computations. The source code, developed on a PC with a single processor, is linked with these libraries, and the parallel code generated is optimized for post-petascale systems. In this article, recent achievements and progress of the ppOpen-HPC and pK-Open-HPC project are summarized. 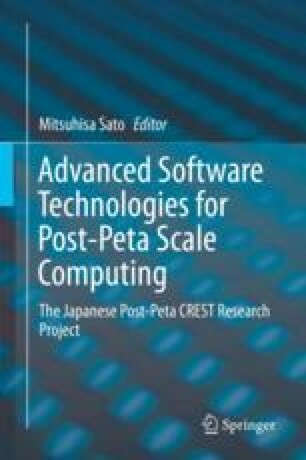 This work is supported by Core Research for Evolutional Science and Technology (CREST), the Japan Science and Technology Agency (JST), Japan, and the German Priority Programme 1648 Software for Exascale Computing (SPPEXA-II). Authors would like to thank Professor Gerhard Wellein (Friedrich-Alexander-Universität Erlangen-Nürnberg, Germany) and members of the ESSEX-II project.